Dress up your air cleaner with this custom decal. The red vinyl lettering will really stand out. Decal is made to cut apart and apply pieces individually. Includes word "International," two small "IH's," and engine cubic inch numbers of your choice. Easy to apply. Looks great with our Valve Cover Script decals. 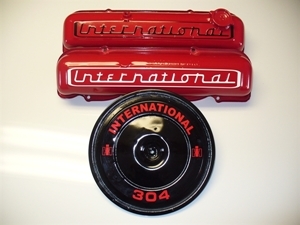 These are made to apply to the raised lettering on IH SV engine valve covers.